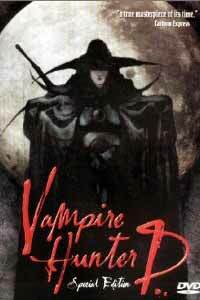 Notes: Based on the Vampire Hunter D novel series by Kikuchi Hideyuki. Far, far into the future, technology will deteriorate to the point where magicks and sorcery will be the dominating forces governing the land. While certain conveniences such as electric lighting will still exist, the scientific rationale will give way to fear and loathing of werewolves and vampires which will begin to walk the earth unchecked once more. Doris lives in this future, and has had the misfortune of being bitten by the vampire Magnus Lee who finds her blood (and her beauty) tasty enough to merit pursuing her further. The other villagers are ready to throw her out, but just as hope seems lost for Doris and her younger brother Dan, a mysterious vampire hunter simply named "D" emerges on the scene, promising to help slay the offending undead. I had heard a lot about Vampire Hunter D, and was quite eager to see it for myself, thinking it would be something along the lines of Vampire Princess Miyu: an intelligent and disturbing title about vampires. Well, one out of three isn't so bad, is it? If Vampire Hunter D were live-action, it could probably easily out B-movie the best out there by Ed Wood. Mystery Science Theater 3000 would probably jump at the chance to "review" it in one of their shows. You'd find it on sale at K-Mart on the $2.99 video rack right next to Vinyl Vixens from Venus and Triceps of Titanium. As it is, though, it's a poorly thought-out and executed flick that makes you wonder what the big fuss was all about. The story simply screams "B-movie," with plot holes abound and characters that seem more gimmicky than real, such as the Italian Godfather Vampire Magnus Lee and his punk, mohawked undead minions. D himself is about as captivating as Van Damme was in his role as Guile in the Street Fighter live-action movie, only that he's slightly less articulate than Van Damme was. I think it's quite telling that the most engaging character in the title is D's wisecracking hand (yes, you heard me right). The character design is highly forced and trite, shamelessly following where all have gone before: the stoic, unflinching hero with a dark past; the helpless and fetching heroine; the ambitious minion who wants to wrest power -- where have I seen these before? It's one thing to base off of what has been established before, but D doesn't attempt to go any further than the cliche. The entire premise is flawed, too -- if Magnus wanted Doris so badly, why didn't he just keep her when he bit her neck the first time? The action scenes are equally uninspired, drawn and animated in a decrepit style that just begs to be quietly forgotten. D's powers as a vampire hunter are vastly overpowered, neatly removing all sense of tension from any of the scenes. Either the villains are all really stupid, or D is too powerful, or both. Watching the fight scenes is sort of like watching someone play Castlevania on the old 8-bit Nintendo, the difference being that I actually kinda _liked_ Castlevania. It would be unfair to say, though, that there is nothing good about Hunter D at all. There are some scenes that are rather repellent in their goriness, and the ending animation is actually quite impressive, especially given the age of this title. On balance, however, the film fails to do exactly what a horror film is supposed to do: horrify. For some good animated chills, check out Princess Miyu, or one of the darker tales by Takahashi (Laughing Target, the Mermaid saga); heck, even Phantom Quest has more effective spooks than D does. But don't expect shivers while watching D unless it's cold where you live.